I've been thinking a lot about the lesbian teacher character in last year's Oscar winner (Best Supporting Actress - Mo'Nique, and Best Adapted Screenplay - Geoffrey Fletcher) Precious (Based on the novel "Push" by Sapphire.) I loved how they had this teacher who really was the only adult reaching out to help Precious, and when the going gets horrible for Precious, it's this teacher who takes her into her home. Then it's revealed that the teacher has a female spouse/partner, and that the teacher is a lesbian. Uh-oh, I thought, watching the film for the first time. I was so nervous it was going to go where Hollywood so often does - that homophobic cliche of queer adults preying on younger innocents. That fear of the charges of "pedophilia" is what fueled the "fire all the gay teachers" crusade of Anita Bryant and the Briggs Initiative back in the late 1970s, and frankly it is still what destroys the bonds between generations. Gay Adults are afraid of being unjustly seen as predators, so we're not there for Gay youth. Gay youth, with no one to guide them, are often lost on their journeys. And Gay Elders, not having had anyone mentor them, are ill prepared to mentor Gay Adults. And because of that the generations are disconnected. And because of that, many of us don't really evolve or mature as individuals or as a culture, we just age. We see this reflected in the larger straight society also, expressed in the near phobia of aging (or showing any signs of aging) but it seems even more pernicious and damaging in our GLBTQ circles, due to this generational isolation. Teachers take the risk to bridge that gap. Their mission is to reach across the generations, to create links of shared information and experience and nurture the passion and journeys of their students. I was so happy that the lesbian teacher in Precious remained just that - a steadfast mentor, trying her best to help this girl find her path. There was no hanky-panky. And I loved the movie even more for being brave enough to let a lesbian be a role model in a movie full of people with such huge flaws. The performances of so many of the cast stay with me, Gabby Sidibe as "Precious," Mo'Nique as her crazy mean mother "Mary," Lenny Kravitz as "Nurse John," Mariah Carey as the social worker, but most of all Paula Patton as "Ms. Rain." If you haven't seen the movie yet, I recommend it (but be prepared, it's intense!) It's a powerful reminder of how great an impact a teacher can make in someone's life. Of how great a teacher can be. And of the power of words - which each of us can yield, and which ultimately help Precious find her voice, and her way. In the real world, too, teachers ROCK! Openly Gay, Lesbian, Bisexual, Transgender, Queer (Gender Non-Conforming) and Questioning Teachers are doubly heroes. For being guides, and role models of authenticity, for us all. So Today, National Teacher Appreciation Day, even if you're not in the USA, tell someone who is a teacher in your life that you appreciate them, and that they are making a difference, to you. Any teacher will tell you - hearing that is better than an apple, any day! 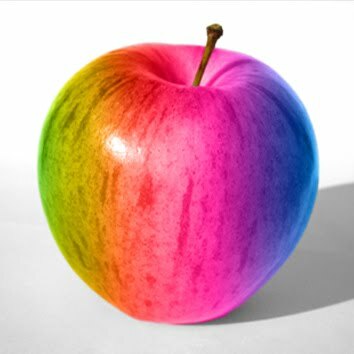 The cool rainbow apple image is from here. I just realized how appropriate this whole occasion is! I had my last class with my openly gay teacher yesterday and I wrote a letter to him about how much I appreciate him. I know it can be hard to be out and a teacher on a high school level, but being a queer teacher in college like mine is amazing. It made my learning environment a little more comfortable and definitely more relatable at times.